It's kind of surprising even to me, but my views on the usefulness of the first-they-must-fight pattern of superhero storytelling have been changing. It's still a cliché but, like all clichés, it also still has a grain of truth in it. Lately, I've even been thinking of episodes in my own past - hell, in some interactions with people right here at the Homepage - that followed that pattern. It might have been brought on in part by the Supes vs Bats buzz around the announced Man of Steel sequel, but, mainly, my view at the moment is that violent conflict needn't be a necessary element in the first meeting of two heroes, and probably lots of times shouldn't be, but that it can in fact work if done in a way that is either or both new and clearly motivated. 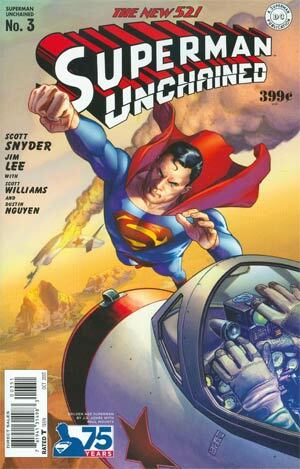 Here in the third chapter of Superman Unchained - which splits its time between a bit of flashback to Wraith's arrival in 1938; Lois Lane's airplane crash off the coast of Nova Scotia and subsequent salvation by a mysterious figure seen hovering onshore in the blue light of a crystal suspended in the air between his hands; and Superman's first encounter with Wraith in the present and his introduction to The Machine, the secret underground facility we've previously seen little of that has served as Wraith's "home" since he arrived - Wraith's motivation is clear. 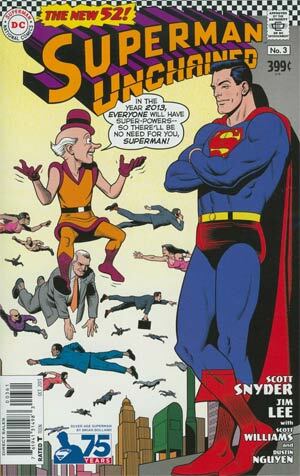 Not why he's serving the US Government rather than taking over the world or something, but why he's confronting Superman in the here and now (Hint: it has to do with working for the US Government). 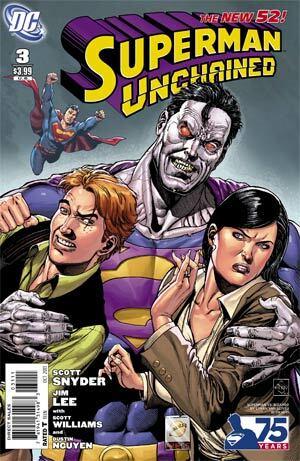 We still don't know much of anything about what Wraith is (other than not-human) or where he came from, but we do know he has genetic similarities to Superman that have been augmented or changed over the decades that he's been exposed to yellow solar radiation. 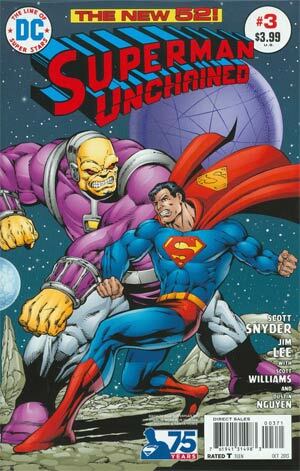 It's made abundantly clear that he is Superman's physical superior, which is fine with me if it leads to Superman having to use his head to prevent Wraith from killing him like he says at the end he will soon have to do. He's shown to be a genuinely credible threat, and you just know that's going to matter. Story - 4: The pattern also plays out differently than it often does, with Wraith exerting the self-control that General Lane seems roundly to lack and exuding a pragmatic and businesslike demeanor throughout the entire sequence that belies both his near-monstrous appearance and Lane's peripheral braggadocio. In other words, it's not all just some random misunderstanding that precipitates a FIGHT™. Some Superman fans will complain about this, though: Superman the hothead getting his rear-end handed to him by a mostly unknown quantity who's hardly fazed by any of it. Anyone who hasn't been enjoying this general... what?... anger? 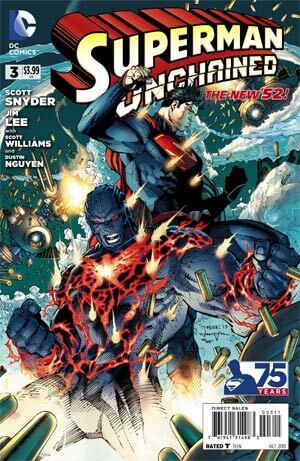 in the New 52 Superman are really not going to like it here. Indeed, I don't exactly like it: he's still surprisingly brash, impulsive, demanding, entitled. I just hope DC has a plan to smooth this out and wisen him up over the coming months and years. In any case, Wraith is one coolly collected character, and my interest in him has just increased exponentially. I can also happily report that Snyder's public remarks about the strong and pivotal role Lois is going to play in this story seem to be holding up, if her determination and clear-headedness during the crash are any indication. For what it's worth, I prefer a Lois who's no damsel in distress but who also gets herself into spots that require Superman's help and sometimes rescue - spots, in other words, where no one else goes because no one else will or can. And this Lois appears so far to be like that. 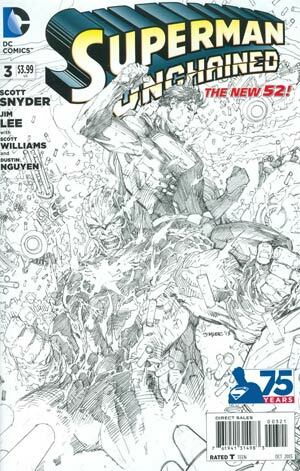 Art - 5: As usual, Jim Lee makes it all dance in a way that I... well, in a way that I just love and always have, at least since his X-Men days, despite the dastardly gimmicking of that era that initially sucked me in but then pushed me away from comic books and superheroes for a while. 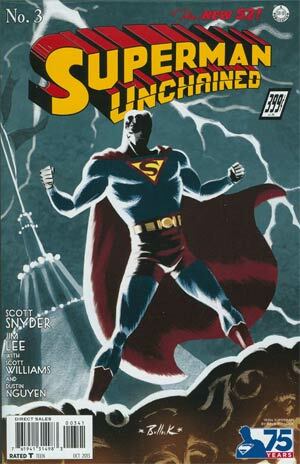 I don't really have a favorite comic book artist, but Lee would easily be in my top 10. Cover Art - 3: On the covers, well as always I choose to abstain from assessing or even just discussing the full range of variants, just the one I happened to buy. This time around, I'll also abstain from discussing my views on variant covers generally. And anyway, I'm assuming there won't always be variants in these numbers (10 this month! 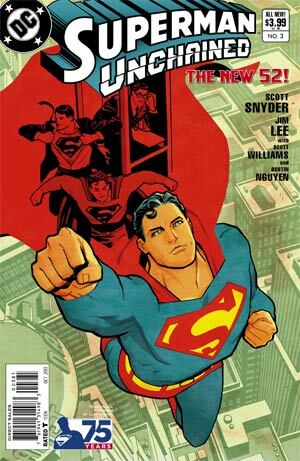 ), probably once the year is out and it's no longer our boy's 75th anniversary. 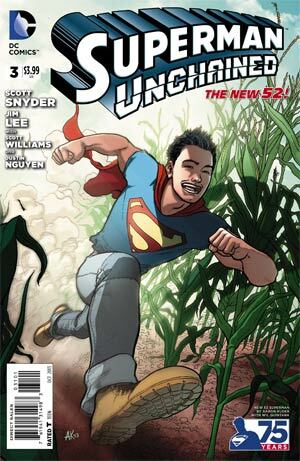 I got the one with the younger Superman in jeans, boots and t-shirt running through the cornfield. 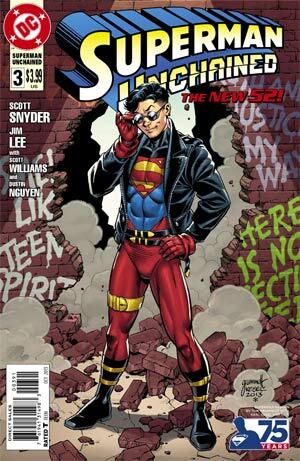 He looks young enough to be Superboy, really. This has practically nothing to do with the story that I'm reading inside the cover and is in some ways kind of unremarkable, but I accept it as play on the undercurrent of historical awareness that is running through the story. So we meet in the middle.